There is no question that your chances of surviving a violent criminal attack increase greatly when you can get your hands on a long gun. As I have previously addressed the defensive shotgun, let’s take a look at the handy defensive carbine. A carbine not only extends a person’s practical range, but it also improves one’s ability to deliver accurate shots. The prompt appearance of a carbine may also resolve a problem before a shot is ever fired simply because a bad guy may very well perceive that he is out-gunned before an altercation ever starts. In short, the carbine can give the armed citizen both a practical and a psychological advantage in a conflict. Also popular for defensive use are the various carbines of the Kalashnikov design, such as the AK-47. This gun is generally chambered for the 7.62×39 Soviet cartridge which has ballistics similar to the American .30/30 Win. cartridge. A number of different AKs are available on the U.S. market and prices are generally reasonable for this tough carbine. While the AR and AK are good guns and good choices for the armed citizen, neither one has really suited me. Let me be clear, I’m not knocking the guns, I am just saying that they have never really appealed to me. Instead, I’ve always preferred the Ruger Mini-14, especially the newer tactical version. When I was serving as county sheriff in southwest Texas, I found that Browning had just come out with a very nice copy of the Winchester Model 92 carbine. I latched onto one in .44 Mag. My gunsmith cut the barrel and magazine tube to 16 inches, mounted a gold-bead front sight, and put a Williams Foolproof receiver sight on the other end. Cut down in this manner, the Browning carbine still held 9 rounds of .44 Mag. ammo, which turned out to be all I ever needed. Nowadays, the Ruger Mini-14 is my car gun (that’s legal in my state) and the Browning 92 does house gun duties. 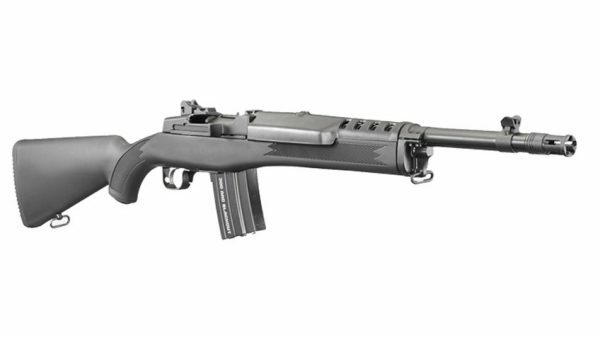 This entry was posted in Guns, Personal Defense, Rifles, Semi-Auto and tagged .223, .30/30, AK, home defense, Kalashnikov, ruger. Bookmark the permalink. I agree about the mini 14 being a very handy carbine. I installed a scout mount and scout scope which really improved my shooting out to about 100 yards. On a personal note I had the opportunity to compliment sherriff Wilson on this blog at the NRA meeting in Dallas this year. I should have taken more time to talk to him an tell him how much I have learned from an enjoyed his many articles.